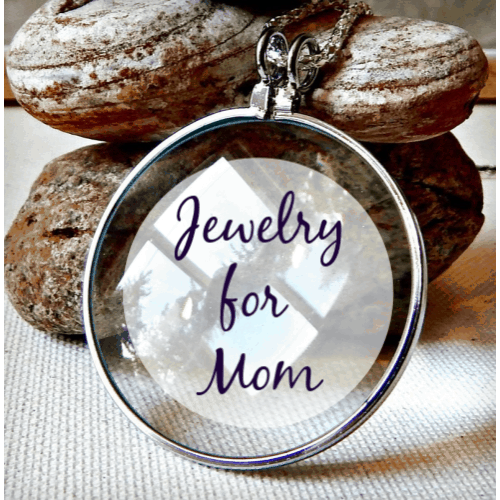 Valentine’s Day is almost here and I have been having fun planning a few activities and crafts for the family. I don’t know about you, but I tend to be a bit of a homebody. I like to stay in, especially when the weather is cold and dreary in February. 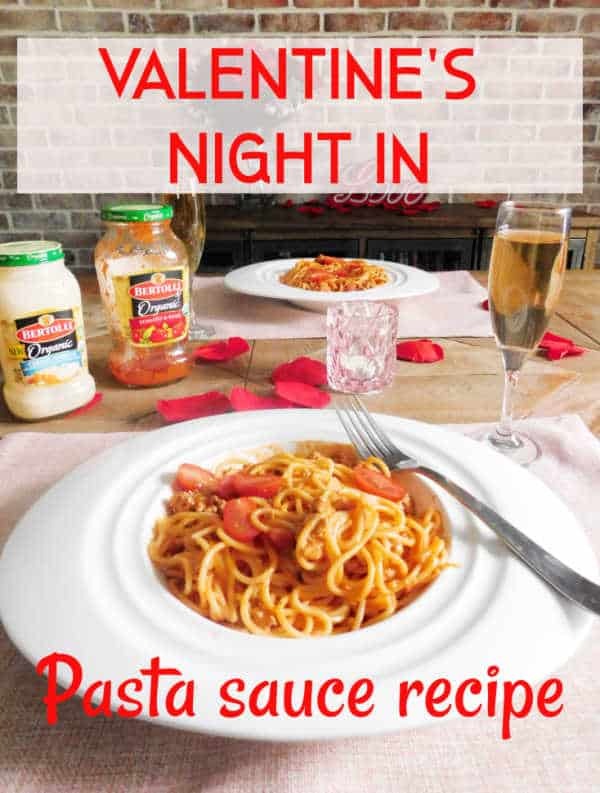 Today I’m sharing my plans for a fun Valentine’s Day dinner rosa sauce recipe, because who doesn’t love pasta? 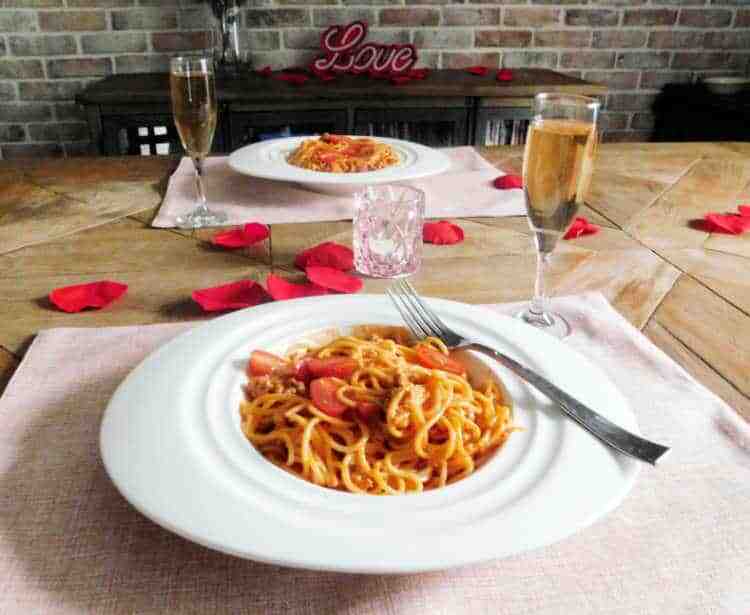 And Italian food is so romantic, isn’t it? 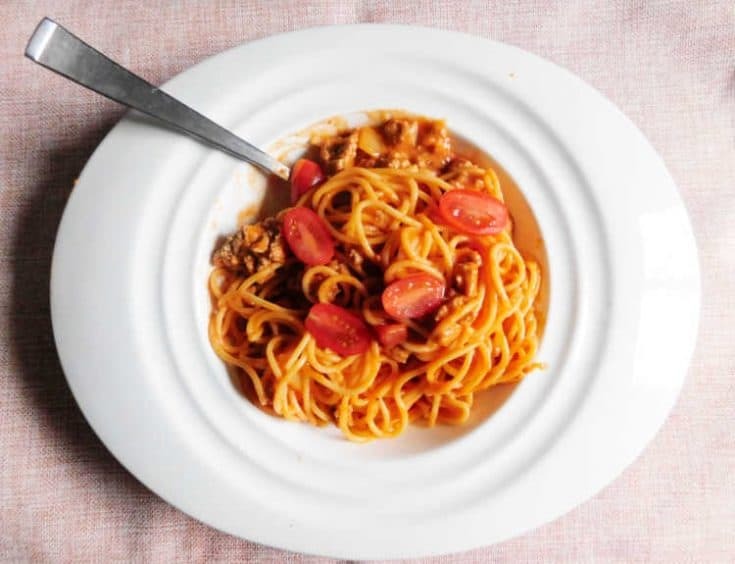 Rosa pasta sauce is a typically a tomato sauce that has heavy cream in it, giving it a ‘rosa‘ (Italian for pink) color. 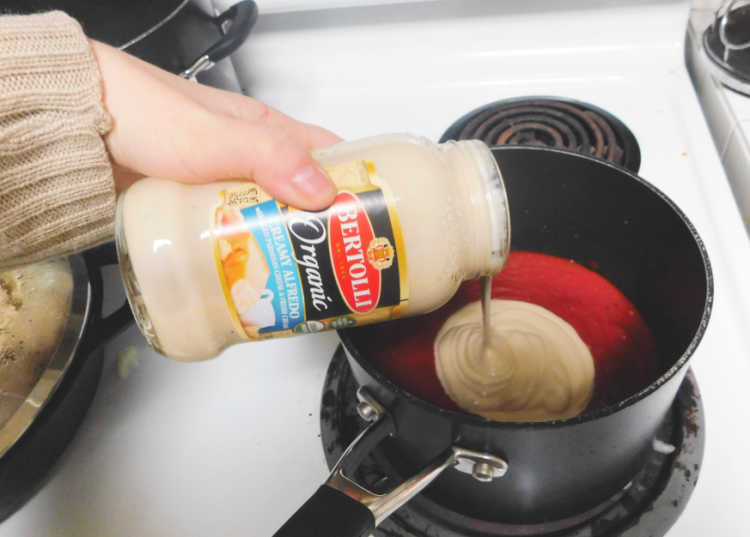 This type of sauce can also be made by mixing a red sauce like Bertolli® Organic Traditional Tomato & Basil Sauce and a white sauce like Bertolli® Organic Creamy Alfredo Sauce. It’s an easy way to turn ready to go organic sauces into a special meal. USDA Organic Product made with non-GMO ingredients. An organic pasta sauce made with the finest organic ingredients, like plump tomatoes, extra virgin olive oil and Romano cheese. 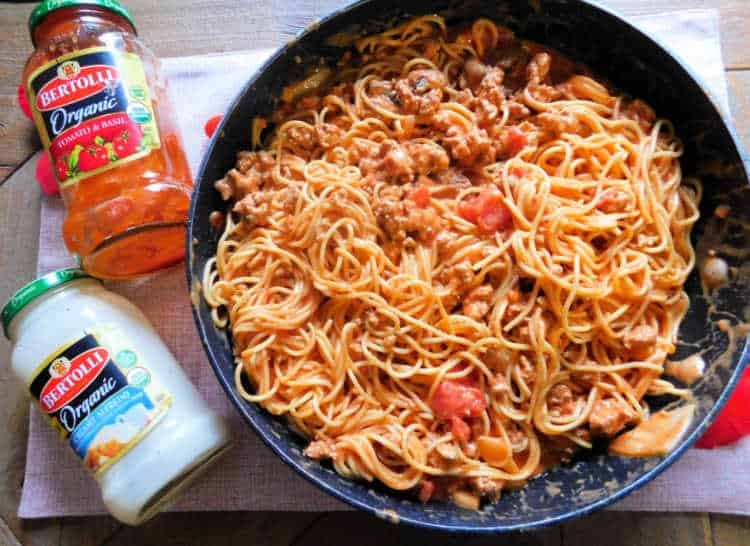 I blended the sauces with extra garlic, chopped onion and cooked ground turkey and then combined it with spaghetti and topped it with sliced baby tomatoes. It’s a fast and easy date night meal that your sweetheart with love. Check out the recipe card below for the full instructions. This delicious rosa sauce is easy to make by combining two Bertolli®Organic pasta sauces. Add chopped onion, garlic and ground turkey for a tasty romantic dinner for two. Begin by boiling a pot of water and cooking the spaghetti according to the instructions on the package. While the spaghetti is cooking chop the onion and sautee it with the garlic on medium heat. Once the onion starts to caramelize add the turkey meat and cook until the turkey is cooked and brown. 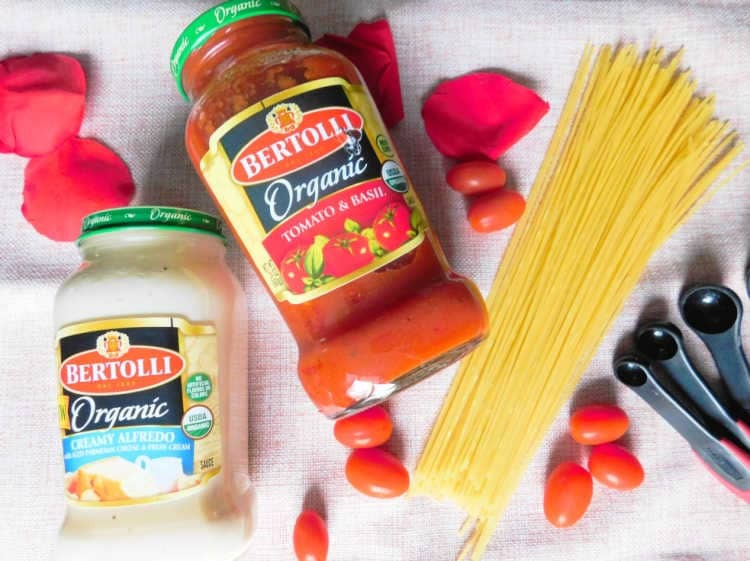 In a separate pot mix the jar of Bertolli® Organic Traditional Tomato & Basil Sauce and the jar of Bertolli® Organic Creamy Alfredo Sauce together to make a rosa sauce. Add the turkey mixture to the rosa sauce. Cook on medium heat and bring to a boil, then turn down the stove and let simmer. Drain the spaghetti and add the drained spaghetti to the meat sauce and stir until completely combined. Serve on plates with sliced cherry tomatoes and Parmesan sauce. 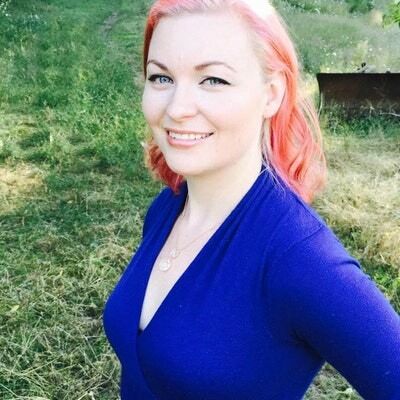 This makes a large amount of pasta. Freeze leftovers for an easy date night meal on another day. What are your plans for Valentine’s Day this year? Let me know in the comments!